Australian researchers have discovered why some galaxies are “clumpy” rather than spiral in shape—and it appears low spin is to blame. “The clumpy galaxies produce stars at phenomenal rates,” Dr Obreschkow said. 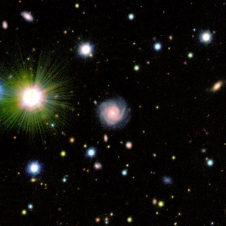 The research team—a collaboration between ICRAR and Swinburne University of Technology—focused on a few rare galaxies, known as the DYNAMO galaxies. They still look clumpy even though they’re seen “only” 500 million years in the past. “We see that galaxy the way it probably looks now… something could have happened to it but it’s very unlikely,” he said. “While the Milky Way appears to have a lot of spin, the galaxies we studied here have a low spin, about three times lower,” he said. “Today we are still revealing the important role that the spin of the initial cloud of gas plays in galaxy formation,” he said. The research was published today in The Astrophysical Journal. Regular spiral galaxies, such as the ‘whirlpool galaxy’ on the left, form far fewer stars than the clumpy galaxy on the right. The blue regions have the least star-forming gas and red-yellow regions have the most. Credit: Dr Danail Obreschkow, ICRAR. Image uses data from the Hubble Space Telescope. 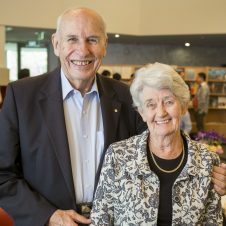 ICRAR is a joint venture between Curtin University and The University of Western Australia with support and funding from the State Government of Western Australia. ‘Low Angular Momentum in Clumpy, Turbulent Disk Galaxies’ published in The Astrophysical Journal on 14th December, 2015. A copy of the paper is available from http://arxiv.org/pdf/1508.04768v2.pdf.